Adoption Showers – Welcoming the addition. Ever hear the term “Adoption Shower“? This type of celebration is increasing in popularity. Whether your new arrival is 12 months old or 12 years old, it is a cause to have a celebration. Here at The Beacon Center, we see traditional baby showers almost every week. We LOVE babies and their parents, regardless of age or any other qualifier. That warm, fuzzy feeling extends to adoptive parents and children as well. Every child, no matter their age, deserves a loving parent or two and we want to help you celebrate this milestone. There are many unknowns when it comes to adopting a child. In most scenarios, the waiting parents do not know when they will receive the child into their home. We understand that everyone, friends and family alike, will be excited to meet the latest addition to the family. If you are the soon-to-be parents, however, you might consider taking time to spend with your child before hosting a big celebration. Most of us out there love surprises, but when it comes to an adoption shower, it is best to play it safe and steer away from the surprise party approach. Adoption timelines are never set in stone. Plans change or get delayed, and as mentioned before, the timing of the official adoption placement is very unpredictable. 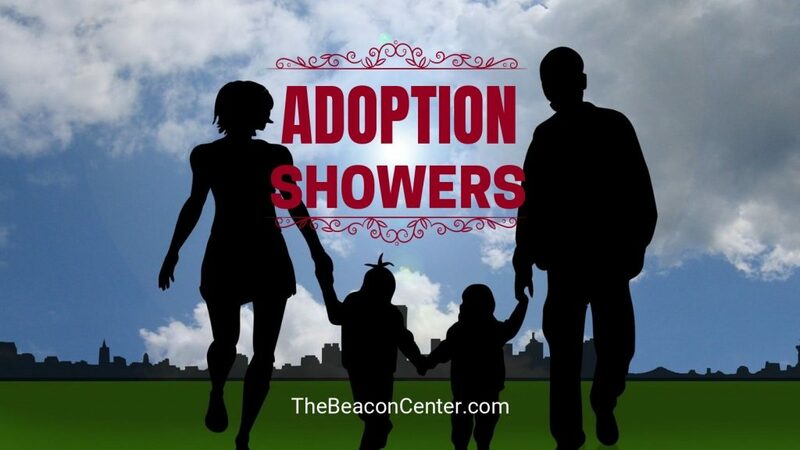 An adoption shower should reflect the adoption journey in some shape or form. If you know the child is of a certain heritage or background, you may consider celebrating that through food or decoration. If you know that the adoptive family traveled by air or car to meet their baby or any other specific tidbits from their adoption story, try to incorporate that into the theme of the party as well. Ever hear the term “Adoption Shower“? As we discovered during the writing of this blog, there is a plethora of information concerning the do’s and don’ts of Adoption Showers or Celebrations. Actually, many of the time-tested planning for regular newborn showers are easily adapted to an adoption celebration like this. Just a little imagination, creativity and the special love of adoptive parents is all you really need. The Beacon Center would be thrilled to help you plan your shower and welcome your “new addition” into your family. Since opening The Beacon Center we have hosted dozens of celebrations such as this. Let us put together a package that combines affordability, simplicity & fun. Just the thing to celebrate your loved one’s adoption. Social Media has greatly reduced the distribution of content in our readers’ newsfeeds. They are instead promoting their own paid sources. When you share with your friends, however, you greatly help distribute our content. Please take a moment and consider sharing this article with your friends and family. Thank you.